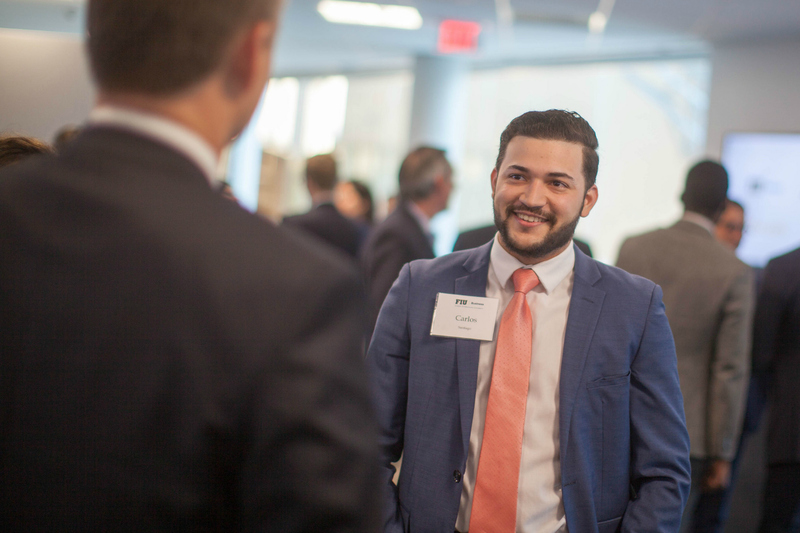 FIU College of Business student Carlos Santiago meets with leadership from SunTrust Banks at the SunTrust–FIU Financial Wellness Clinic. Have work clothes you’ve been meaning to donate? Now is the perfect time to do some spring cleaning in your wardrobe because the Career Closet, a new program through FIU Career and Talent Development, needs donations. The Career Closet, which soft-launched last week, is a mobile professional clothing closet that provides free suits and other professional attire to FIU students prepping for interviews and career fairs. The program is open to any currently enrolled FIU students and encourages career development. In order to qualify, students must first have their resumes critiqued by Career and Talent Development and then complete three of the department’s career workshops, which cover such topics as personal branding and interview skills. Once a student has completed those steps, they may sign up for an appointment with a Career Closet consultant to be fitted for a professional outfit. Each student may take, and keep, one full suit or up to four separate pieces, including blouses, shirts, pants, skirts, jackets, ties and belts. Then the student is ready for the final step: attending a career fair, internship fair or practice interview program at any campus. Students can repeat this process to receive new clothes once per semester. Career Closet consultants are looking to build their wardrobe inventory. Though they have collected a small selection so far – for women, there are nine suits, seven work jackets and four tops; for men, there are two suits, nine dress shirts and six ties, generously donated by FIU employees – they need more to support FIU’s large student population. “We encourage everyone at FIU to fill the needs for our students and to participate in our donation program,” Rojas said. Clothing must be no more than five years old. Submitted items must be dry-cleaned. Clothing must be in good to excellent quality, showing no visible tears, stains or other signs of wear. Donations may be submitted at SASC-305 at the Modesto A. Maidique Campus and WUC-255 at the Biscayne Bay Campus. For more information, contact Elery Rojas at elerojas@fiu.edu (MMC) or Mercedes Dericho at mdericho@fiu.edu (BBC).